Life on the edge is no picnic, as Canonical will tell you having set a record for the most money raised through crowd-funding but missed its target for the Ubuntu Edge phone by, well, quite a lot. The deadline of 11.59pm on August 21 came and went with $12,809,906 in the pot (around £8m or AU$14m) - just under $20m off Canonical's target of $32 million (£20m / AU$36m). Crowd-funding site Indiegogo is letting the company off its usual fees and the $12.8m pledged will be returned to backers. Speaking to the Guardian, Canonical founder Mark Shuttleworth said he won't be letting a little thing like failure put him off. The company had hoped that another "industry player" would kick in the last $20m to get the Edge project off the ground - but since none did, Shuttleworth says it is likely to focus on regular smartphones running the Linux-based OS rather than the bleeding-edge specs the company had planned for the Ubuntu Edge. 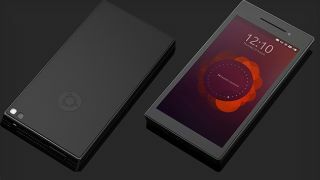 The Edge was set to run both Android and Ubuntu Mobile, with the handset able to act as a desktop computer when plugged into a larger screen. Shuttleworth explained that Ubuntu is still an attractive alternative to Android. He said, "The impression we have from conversations with manufacturers is that they are open to an alternative to Android. And end-users don't seem emotionally attached to Android." The positive thinkers among us might posit that the project was, in fact, a bit of a success. After all, when was the last time anyone ever gave Ubuntu this many column inches?